Facevsion FVexpress Combo empowers your PC to deliver best-in-market high definition 720p 30fps video communications experience at substantially low bit rate anytime, anywhere. Vsion FVexpress Combo empowers your PC to deliver best-in-market high definition 720p 30fps video communications experience at substantially low bit rate anytime, anywhere. FVexpress Combo includes the FV Touch - Cam L1, the i - F award-winning Video - Cam that features wide angle High Definition images at 30 frames per second for superb, crystal clear video calls over the internet. World's first Express - Card empowering any PC with Express - Card slot for 2-way 720p 30fps video calls; Smooth and rich video calling experience with superior image and audio quality using Qu - Lives (Gmail accounts required); - Card comes with H.264 codec for efficient HD video processing at low CPU power and internet bandwidth; Award-winning HD Video - Cam featuring 28mm wide angle, 2 megapixel and autofocus. 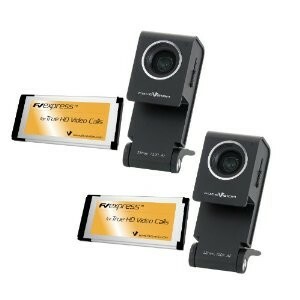 Includes FVexpress card, FV Touch - Cam L1, Quick Start Guide, Qu - Lives Installation CD, Camera USB cable. Express34 or mini PCIe card slot. Optional adaptor available: ExpressCard-to-PCI for desktop .